McConnell Enterprises, Inc. is entering its twenty-third year working in New England and New York. We are an industrial and railroad dismantling company that also deals in scrap metal processing, concrete recycling and creosote wood disposal. Our new environmental division has expanded the services that McConnell can now offer. We operate a 13-acre scrap recycling and storage yard in Braintree, Massachusetts with an office, shop facilities, a truck scale and a railroad siding off the CSX Middleboro line. The accessibility of our rail siding allows McConnell to load and unload railcars directly from the Braintree yard. Our accounting office is in Essex. The mainstays of McConnell's equipment include six hydraulic excavators with Labounty attachments, front-end loaders, tractor-trailers, roll-off trucks, and roll-off containers. McConnell also has a 2006 OM Apollo Jaw Crusher on Tracks, a Pioneer 36” x 42” Jaw Crushing Plant to use for on-site concrete crushing and a Grundler Wood Grinder for recycling demolition debris. Crosby Martin, the corporate president, began the company in 1981 as a land clearing and demolition company. McConnell Environmental was formed as a division of McConnell Enterprises, Inc. in May 1999. Mr. Martin has over 25 years of experience and leadership in the demolition field. In those years McConnell Enterprises has successfully completed many demolition projects requiring varying degrees of expertise. Many of McConnell’s employees have been with the company over 15 years. 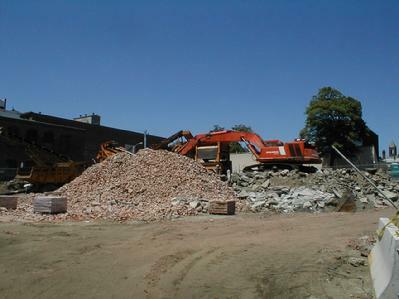 Massachusetts DCAM Certificate Demolition and Asbestos Abatement, Mass Highway Dept. Certificate Demolition and Asbestos Abatement, MBTA certified for Track Demolition/Building Demolition, Massachusetts Asbestos Contractor License No. AC000461, State of Rhode Island Asbestos Abatement License, State of Connecticut Asbestos Abatement License, State of New Hampshire Asbestos Abatement License, State of Maine Asbestos Abatement License. Key customers for McConnell include Mass Development Finance Agency, J.F. White Contracting Co., Jay Cashman, Inc., GZA GeoEnvironmental Inc., G.V.W. Inc., Columbia Construction and Cutler Associates, Inc. Content Copyright 2013. McConnell Enterprises, Inc. All rights reserved.